Ireland is a country of words. Spoken, written or sung, the Irish are famously verbose and social people known for their warmth, hospitality and generosity. The Irish live in the spirit of togetherness, sharing and interaction. Inspired by this human connection, Waterford's Ogham Short Stories collection celebrates Irish heritage using the Celtic alphabet of Ogham to express four key sentiments - Happiness, Joy, Love and Peace. 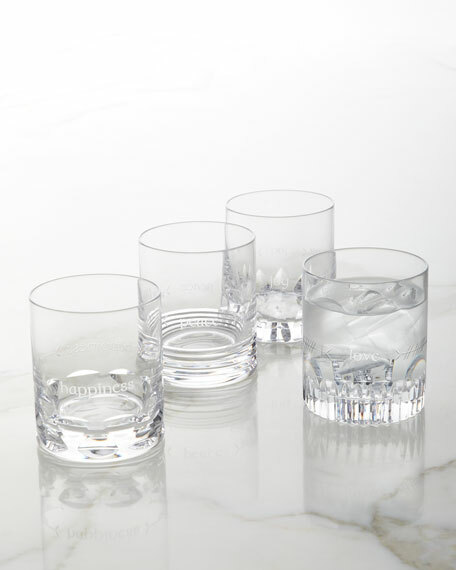 This Ogham Double Old Fashioned mixed set of four is ideal for enjoying your favorite vintage cocktails. Perfect for gifting, this set is presented in classic Waterford packaging. Set of four assorted crystal double old-fashioned glasses.